Music & My Mind: MoMoMu: Oliver! Here it is, finally. Consider this as August's MoMoMu because I started writing this ages ago and there's been a bit of a break with MoMoMus during the summer months. So I'll give you another film musical review later in September! When Cameron Mackintosh – megaproducer of huge hit musicals such as The Phantom of the Opera, Les Misérables and Cats – announced that not only was he bringing Oliver! to Broadway but was also planning a remake of the film version of that same musical, the musical theater fandom, true to its habits, immediately united behind the opinion that this was the most unthinkable idea ever. The 1968 film is a masterpiece, it raked the Oscars! went all the fan forums. Nobody can top Shani Wallis' Nancy! Cammack's just after the money! The Oliver! musical film of 1968 seems so dearly loved by everybody and it is true that it collected an impressive number of awards (including Academy Awards for Best Picture and Best Director, and a Golden Globe for Best Film – Musical or Comedy), which made me wonder what indeed might be Mr Mackintosh's motivations behind a remake. Well, I watched the film and my extremely unpopular opinion is: Mr Mackintosh, please get that remake going! As you will know if you've read the Dickens novel, seen any version of the musical or read my Oliver Twist post, the story follows young orphan Oliver Twist from the misery of a parish workhouse to the dangers of London's East End, eventually leaving him to the care of kind, long-lost relatives. For understandable reasons, the musical simplifies the plot somewhat and cuts some of the characters that show up near the end of the book. However, Oliver does encounter e.g. London's quickest pickpocket the Artful Dodger, his employer Fagin, soulless criminal Bill Sikes and his devoted girlfriend Nancy who comes to a tragic end. The beginning of the film is actually quite promising. Like the stage musical, it opens with the hungry workhouse boys singing Food Glorious Food, and the way the grey-clad, depressed children shuffle in unison with their food bowls held out makes quite an impact. The next musical number, where Mr Bumble the workhouse beadle walks Oliver down the snowy streets announcing there's a Boy For Sale, is the best moment in the film if you think in terms of capturing the spirit that Dickens was going for in his book. However, Mr Bumble's actor Harry Secombe gets all the glory in this little scene because by now it has become very clear that Mark Lester, our Oliver, can't act for dear life. From here, the film just goes downhill. I've come to the conclusion, in my years of watching films, that child actors fall into two categories. They're either totally adorable and really talented, like Jack Wild who plays the Artful Dodger and makes my favourite performance in this film, or they have absolutely no idea what acting even means, like Mark Lester. 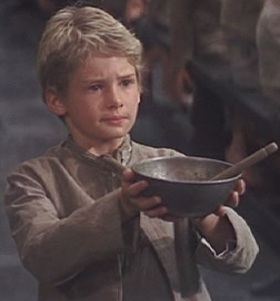 Oliver Twist is a very passive character anyway, so if his portrayal is so painfully awkward that the viewer can't even feel sympathy for him in his plight, the whole point of the character – and the entire story as well, as he's supposed to be the center of it – goes up in smoke. I honestly can't figure out how Mark Lester stood out in the audition process, because he couldn't even sing. Yes, dubbing has happened many times in film musicals (please remember to give Marni Nixon all the credit she deserves from My Fair Lady, West Side Story and The King and I films just to name a few) but usually the actor and the singer are of the same age group and gender. Not so in Oliver! – Mark Lester's singing was dubbed by Kathe Green, daughter of the film's music director, who was 24 at the time when Oliver! was made. Apparently the filmmakers thought that a grown-up woman can sound like a little boy if she wheezes out the songs in a soft, whispery voice, but I certainly don't agree. How come is it possible to find dozens of singing and acting boys through auditions whenever there is a stage production of Oliver! going on, but they couldn't find one for this film? Alright, so Mark Lester isn't quite up for the job of being the main character. Can we find any others in the cast who could save this film? I already mentioned Jack Wild, and he certainly lights up the screen every time he appears with his adorable top hat. He's got the voice, he's got the look, and he's got the moves. 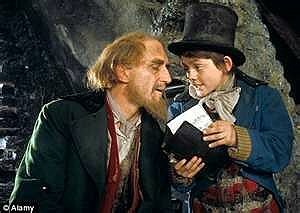 So does Ron Moody, who reprised his role of Fagin which he had originated in the stage version. Moody handles the transition from stage to screen expertly, and he has great chemistry with Jack Wild's Dodger. What about our lead female? The lady in the iconic red dress who experiences the most terrifying of death scenes – Nancy. Shani Wallis gets mountains of praise for her portrayal of the character, but unfortunately not from my direction. I will not say she's downright bad. She has a beautiful voice and she can act to some extent, but she isn't Nancy – she's some sort of a Barbied version of Nancy with perfectly coiffed golden hair and a voice that delivers the songs like they would sound in a recording studio, not in the actual situations where Nancy is in. Dickens' Nancy is a prostitute and a heavy drinker who doesn't get sanctified till the end of the novel, but Wallis' Nancy (or the Nancy that the film production team wanted) is so pretty and angelic to begin with that it is impossible to believe her when she sings "I rough it, I love it" during It's A Fine Life when she appears for the first time. Her performance of Nancy's power ballad As Long As He Needs Me is downright boring, no matter how much I adore that song otherwise. But this isn't entirely Shani Wallis' fault – there is another issue connected here, which I will start talking about now. In my opinion, a really good film adaptation of a musical balances on the fine line between respecting the original stage version and bringing in something new. While us musical fans are anxious to see that a film musical stays true to our favourite songs and characters, it is equally important that the filmmakers take into account how different the stage and the film are as story-telling media, and try to make the most of the cinematic tools. Many things look great on stage but don't serve any purpose on screen – such as the numerous, never-ending, over-choreographed dance numbers in the Oliver! film. Of course, dance numbers are an integral part of most musicals and I probably don't respect then enough because I understand very little about that art form myself, but the way every single group scene in this movie turns into an elaborate dance sequence where every movement is choreographed, it just annoys me. They could have easily shortened some of those massive dance routines and kept in My Name instead, because it builds up Bill Sikes' character so well that I get chills each time I listen to it, and if Bill doesn't get his song we really don't get to understand what lies in the depths of his pitch black soul. All the things that I've complained about so far – the casting and acting choices and the treatment of the musical numbers – are really connected to one major issue: the overall style of the film. It seems to me that the production team was going for a nice, family-friendly version of Oliver Twist's story. Why else would they make Nancy into every little girl's role model and refuse to show us what a gritty place the poor side of London really was, instead giving us a humongous, over-long dance party where we see members of every possible profession smiling and skipping around, apparently just to show the newly-arrived Oliver what a charming, welcoming place Victorian London is? I refuse to give Oliver! the excuse of "it was made in the sixties so it's just a little outdated from a modern point of view". Sound of Music and My Fair Lady are both film musicals made in the sixties, and they are still great to watch. Many people seem to appreciate Oliver! out of nostalgia, and I can understand them. I grew up with the Sound of Music film like many people probably grew up with this film, and I can't honestly say whether I find it hard to criticize my childhood favourite simply because of the golden gleam of nostalgia or because it really is that good. So fans of the 1968 Oliver! film, I'll gladly let you continue loving that film, if you let me anticipate eagerly the remake that Mr Mackintosh promised. Brava, brava, bravissima! *claps* I agree with everything you've said of course. I never liked the 1968 film as a child so I've never had that sense of nostalgia and affection towards it that others seem to have. It wasn't until I finally got to see the stage version that I thought "Yes! This is so much better! This is what 'Oliver!' is actually supposed to be!" I would love a new adaptation of the stage musical - a film that has actually got a gritty look and feel, an Oliver that can actually sing and act, etc. Yes, and a Nancy who can put emotion into her songs! It's so nice to know there's going to be at least one person besides me who will be thrilled when (I won't say if) we get new info about this remake!